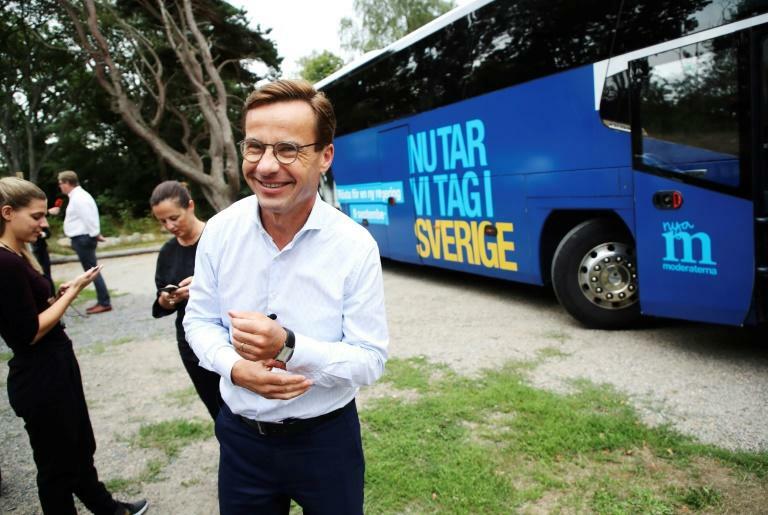 The challenger to become Sweden's next prime minister, conservative Moderates leader Ulf Kristersson, is an eternal optimist chasing voters seduced by the far-right who claim soaring immigration is straining the country's famed welfare model. With a long career spanning local and national politics, the 54-year-old former gymnast will need nimble acrobatics to wrest power from Prime Minister Stefan Lofven's Social Democratic-led government and simultaneously fend off the anti-immigration Sweden Democrats (SD). Kristersson's campaign ahead of Sunday's election has focused on limiting Sweden's generous benefits to encourage people, in particular immigrants, to enter the labour market. "We need to focus on jobs and integration so we can prioritise the core of the welfare system," including universal health care and education, Kristersson said as he presented his party's election platform. Intellectual and analytical, economics graduate Kristersson is seen as a talented communicator. Viewers repeatedly voted him the winner of televised debates pitting him against Lofven -- but despite that he has struggled during the campaign, losing ground toward the end. His communication skills have also been frequently tested since the party swung its immigration policy 180 degrees -- from former Moderate prime minister Fredrik Reinfeldt's 2014 "open your hearts" speech to Swedes on the eve of Europe's migrant wave, to today's restrictive policies as the party vies for the same voters as the far-right. Apart from a stint in the early 2000s as a communications director, Kristersson has spent his entire career in the Moderates after founding a youth branch at his secondary school. He rapidly became a rising star and was elected head of the national youth wing in 1988, spearheading a neo-liberal faction. But in 1992, he lost a bitter leadership battle to Reinfeldt, also a neo-liberal but more conservative -- who went on to become prime minister from 2006-2014. That loss, and the rift the rivalry created, affected Kristersson deeply, impressing upon him the importance of putting the team first, observers say. Kristersson entered parliament in 1991. He later served as city councillor in his hometown of Strangnas and in Stockholm, as social security minister under Reinfeldt from 2010-2014, and then as shadow finance minister. In October 2017 he took the Moderates' reins after his predecessor Anna Kinberg Batra was ousted by a faction of the party for saying she was ready to negotiate with SD on a case-by-case basis. Kristersson has insisted he won't negotiate with SD, which is neck-and-neck with the Moderates in the polls behind the Social Democrats. He has vowed to form a government with three other centre-right parties. But the so-called Alliance and Lofven's left-wing bloc each look poised to win around 40 percent of votes, which would create a parliamentary deadlock with no bloc holding a majority and neither willing to accept SD's support. To form a government, Kristersson would either have to seek out informal support from SD, or form a groundbreaking cross-bloc cooperation with the Social Democrats. Both options would involve huge hurdles. Kristersson comes across as easygoing and open to discussion and has a ready smile. Those qualities will be key in the thorny negotiations that will ensue if he is called to form a coalition government. But critics question whether he has the leadership to govern at a time when Sweden faces rising polarisation, mounting nationalism, populism and information wars, a more assertive Russia and a possible economic downturn. His detractors call him a "coffee-break politician": all talk, no action. According to Sweden's paper of reference Dagens Nyheter, some Moderates have internally criticised his party leadership for acting "too much like a right-wing think tank" rather than a party focused on results. Despite his youthful and bespectacled boy-next-door appearance, Kristersson is no stranger to controversy. In his 1994 book "Non-Working Generation", he compared Sweden's labour market regulations -- a key part of the welfare model -- to South Africa's apartheid system: oppressive and encouraging passivity. A runner and hunter, Kristersson is married and the father of three daughters adopted from China.